For years I’ve been telling people that there is an enormous untapped market for artifact testing, and that they should hold on to their artifacts because a company will arise to offer this service. I typically follow that up by telling them NOT to literally “hold on to their artifacts” because I don’t want them to contaminate them! But seriously, there are many thousands, potentially millions, of artifacts that could possess DNA from long-dead individuals. 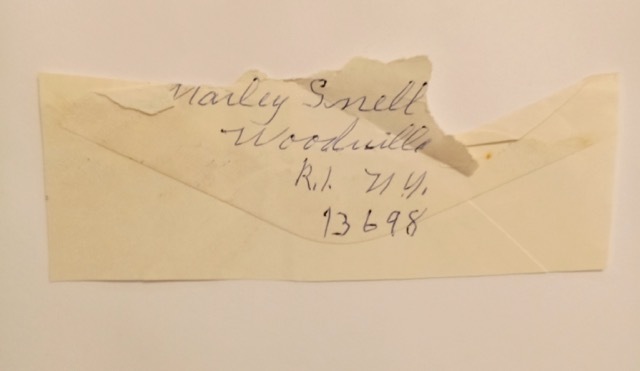 Earlier this year, The Family Curator Denise Levenick wrote “How to Preserve and Test Old Letters for Grandma’s DNA” which discusses storage of items that might be suitable for artifact testing. She also discusses Living DNA and a possible artifact testing service: “I asked David Nicholson, Managing Director of Living DNA, if extracting and testing DNA samples from old letters or postage stamps would be available to the general public and he confirmed that this service would be widely available by the end of 2018 at a cost of $1,000-$2,500.” Read the post to learn more, including great tips about STORING your artifact safely! What Artifacts Might be Useful? The most obvious artifacts are going to be those likely to have good DNA and are easily processed. 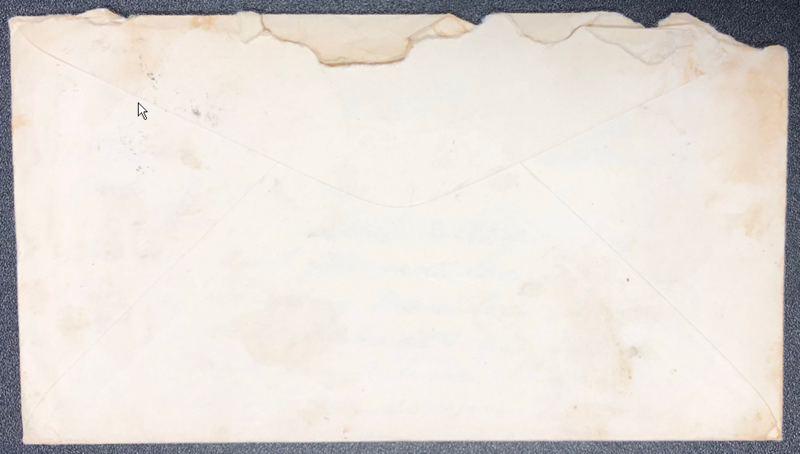 Envelopes or postcards with licked seals and/or stamps are among the best, as the saliva is likely to contain DNA and the paper can be easily processed. There are potentially many other types of artifacts that could be used, including hairbrushes (as they’ll have hair with roots), toothbrushes, rings, hat brims, and anything else that might pick up skin cells. But what about the inevitable HAIR? Unfortunately, most hair samples were cut rather than pulled out with roots, and thus are likely to only contain mtDNA. While I never say never when it comes to DNA, hair cuttings and wreaths are likely to not be useful for autosomal DNA testing. Hair that was pulled out, such as in a hairbrush, could be perfect for testing. 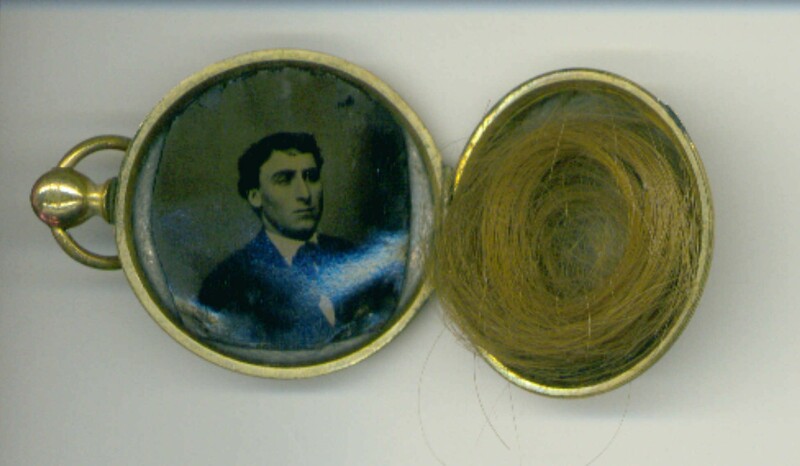 This is Egbert Albro (1851-1922), my great-great-great-uncle, and a lock of his hair. Unfortunately for me (but fortunately for him! ), the hair was cut rather than pulled out, and this is unlikely to possess any of his autosomal DNA. Although hair cuttings are going to be problematic, there are potentially many useful artifacts that could be used as these services continue to expand. 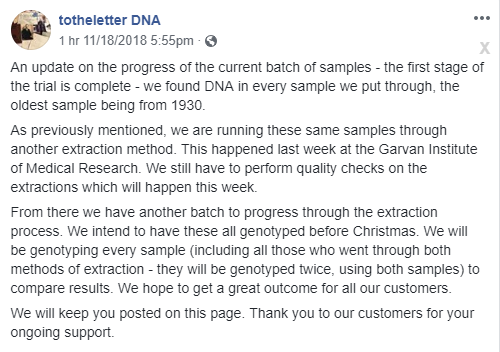 One of the first commercial DNA artifact tests for genealogy is from an Australian company called totheletter DNA (https://www.totheletterdna.com/). The company is focused on testing envelopes and stamps. Before considering a test, be sure to read the Envelopes FAQs. Before placing an order, totheletter DNA instructs you to “send a photo of the front and back of the envelope, postcard or aerogramme to info@totheletterDNA.com for review.” They will then review the images to determine whether there are any problems, and will send you an email with the assessment. If extraction is successful the DNA will then be genotyped using a SNP chip similar or identical to the chips that the testing companies use. You can receive the raw data file via USB or digital transfer as you see fit. That data can be uploaded to GEDmatch Genesis by you or totheletter DNA for matching and ethnicity analysis. Who and Why – who is behind totheletter DNA, and what is the purpose of the service? Genetic Genealogy – why do artifact testing? I currently have two samples processing with totheletter DNA, each of which I’ll discuss below. I’m not certain, but I doubt the GSA chip has been customized (as it is for 23andMe). Accordingly, I don’t think it will include Y-DNA and mtDNA SNPs, but hopefully others with more information about uncustomized GSA chips can provide a comment below. For more about the GSA chip as it pertains to genealogy, see Debbie Kennett’s post (“23andMe launch a new v5 chip and revise their health and trait offerings in the UK“). As detailed above, the current cost of extraction and genotyping by totheletter DNA is $781.50 Australian (currently about $585 USD depending on exchange rates). Many have expressed an interest in engaging these services with a hope that the prices will go down. Personally, I do not expect the prices to diminish significantly in the near future. We’ve been a bit spoiled by the testing companies, which operate on a thin margin (sometimes losing money because DNA testing gets people in the door and they have other services to sell), and which use automation to process samples. For example, a single lab tech at AncestryDNA can load a robot with hundreds or thousands of samples with minimal effort. Every sample is processed exactly the same way because every sample is exactly the same. Obviously, that will never be the case with artifact DNA. Every artifact is different and must be individually analyzed and processed by a lab tech. Although the process can be scaled by adding more lab techs, it will be challenging to scale by finding ways for the same lab tech to process more samples. The process will become vastly more efficient as methodologies are solidified and practiced, but it is unlikely to significantly reduce prices in the near future. When it comes to DNA, we learned long ago to never say never. Five, ten, or twenty years from now, artifact testing might be a breeze and very affordable. And with MyHeritage possibly getting in the artifact testing game, they may be able to subsidize pricing. But I do expect prices to be significantly higher than standard genotyping for the foreseeable future. The first extraction was purchased on October 13, 2018 for a total of $736.50 AU (USD $526.03). The sample (shown and discussed below) was mailed on a rush via USPS on October 15th and arrived at the destination in Australia on October 22nd. Accordingly, the first sample is currently being processed but at least the first extraction attempt successfully identified DNA. Whether that DNA is able to be genotyped remains to be seen. It is still entirely possible that the DNA is not of sufficient amount or quality to be genotyped successfully. The second extraction was purchased on November 8, 2018 for a total of $781.50 AU (USD $583.78). The sample (shown and discussed below) was mailed via USPS on November 12th. The envelope is post marked 25 September 1945, making the DNA about 73 years old. This letter was written by a man from Rochester, New York while he was vacationing in Edmundston, New Brunswick. I don’t have specific information about the provenance or the storage conditions for the artifact for most of its life, but it is physically in good shape. The entire envelope, minus the enclosed letter, was sent for testing. As of this writing (18 November 2018), extraction for this second sample has not yet commenced. EDIT (27 November 2018): totheletter has received this second sample. What Next? What Can I Do With the Results? If totheletter DNA is able to extract and genotype DNA, what happens next? How can we use the results for our genealogical research? Accordingly, you can receive a copy of your raw data file by hard copy or digital, and you can optionally have the raw data uploaded to GEDmatch Genesis. Genesis is a separate database at GEDmatch, kept separate because the Global Screening Array (GSA) chip from Illumina is not as compatible with other chips used by the testing companies. Accordingly, GEDmatch is working on algorithms and methodologies to make the GSA chip results compatible. For more about this chip, see Debbie Kennett’s post (“23andMe launch a new v5 chip and revise their health and trait offerings in the UK“). This explicit permission is in stark contrast to the testing company Terms and Conditions, discussed below. B. Upload the Results to a Testing Company? Below I look at the Terms & Conditions of Family Tree DNA, Living DNA, and MyHeritage DNA. Since it is not possible to upload DNA to either 23andMe or AncestryDNA, it is not necessary to analyze their Terms & Conditions. NOTE: THIS IS NOT LEGAL ADVICE. I repeat, THIS IS NOT LEGAL ADVICE. Again, THIS IS NOT LEGAL ADVICE. You are not my client, and I’m am not your attorney. Consult your own attorney – it will be someone other than me, since I’m not your attorney – as necessary. Although uploading artifact DNA is not explicitly prohibited, the restriction that a “sample” be your own or of a person for whom you have legal authorization might not include artifact DNA. A liberal interpretation of “sample” could arguably include artifact DNA (the T&C definition: “‘DNA sample’ or ‘sample’ refers to the cheek swab or any other sample you have provided for the purposes of Genomic Sequencing.”). Do you have “legal authorization” to upload DNA you obtain from an artifact? There may not be any explicit legal authorization, so could the fact that you aren’t prohibited from using artifact DNA by a law (if that is accurate where you reside!) mean that you have legal authorization? These types of questions will be important to consider. Also, could uploading artifact DNA be considered a “forensic examination,” for which we cannot use the Services without written permission? I feel strongly that it would not be a forensic examination. “Forensic” is defined as “relating to or dealing with the application of scientific knowledge to legal problems,” and most artifact DNA used for genealogical issues are not being used to examine legal questions. When you upload genetic data to Living DNA, “[y]ou undertake, promise, warrant and agree as follows…[t]hat you are an individual aged over 18, and that the genetic data that you upload to our Site will be: i) your genetic data; [OR] ii) the genetic data of a child where the requirements of paragraph 8.3 below are met; [OR] iii) the genetic data taken from a deceased person where the requirements of paragraph [MISSING CONTENT HERE]. Once again, the Terms & Conditions do not explicitly prohibit artifact DNA uploading, but might be the most restrictive in the current embodiment given this sentence: “Results are either your DNA or the DNA of a person for whom you are a legal guardian or have obtained legal authorization to provide their DNA to us.” If I obtain DNA from an envelope, I potentially haven’t obtained legal authorization to provide the deceased person’s DNA. Here, it’s harder to argue that a lack of legal prohibition to obtain & use artifact DNA is equivalent to “obtain[ing] legal authorization to provide their DNA to” MyHeritage. As noted above, artifact DNA is unlikely to be considered a “forensic examination” given the definition of forensic as as “relating to or dealing with the application of scientific knowledge to legal problems.” Most artifact DNA used for genealogical issues are not being used to examine legal questions. I expect that MyHeritage will adjust their Terms & Conditions in the very near future, as they announced at their recent MyHeritage LIVE conference in Oslo that they are exploring artifact testing. I’m still mulling these clauses over, but my interpretation of the current Terms & Conditions suggests that uploading artifact DNA to Family Tree DNA and MyHeritage is potentially a violation, while it might not be a violation at Living DNA. Again, NOT legal advice, merely my own personal interpretation. You CAN upload DNA from a deceased individual obtained from a tested artifact if: (i) you own or have permission to test the artifact; and (ii) it is not the DNA of a living person (see the restriction just above); and (iii) doing so does not violate any laws or regulations. Although not perfect (we could certainly wordsmith and improve these), this more clearly defines the parameters within which a person could upload DNA to a company database, rather than forcing us to guess or pay an attorney for a legal opinion! But What if it Isn’t Great-Grandmother? One of the biggest concerns people cite when discussing the use of artifact DNA is the inevitable situation that will arise; namely, that the obtained DNA will not be from the suspected individual. For example, perhaps an adult asked a child to lick an envelope or stamp, or let the postmaster do the licking when the envelope was mailed (or potentially the envelope was moistened with a sponge, which is always a possibility). There is no question that this will happen. Indeed, people are likely to sequence many postmasters over the coming years! However, obtaining unexpected DNA results is not a significant or insurmountable problem, especially when it should be an expected possibility. In most cases, it will be immediately obvious that someone other than the expected individual was sequenced. For example, if the DNA profile from my great-grandmother comes back and it doesn’t share DNA with me, then it isn’t from my great-grandmother and I can try to figure out who it is from. Or if it comes back and it shares 1,700 cM with me, my great-grandmother likely asked her granddaughter (that lived next door) to lick the envelope for her. The most challenging situation might be where there is no hypothesis prior to testing about who provided the DNA found in the artifact, and no expectation that the artifact owner will be related to the DNA. However, identifying the likely source of DNA from a mystery provider will be straightforward, as it is the same method used to work with DNA results from adoptees. An individual shall only test an artifact that they own or have permission to test. An artifact shall not be tested with the intent to analyze the DNA of a living person. An artifact shall only be tested if the likely DNA profile(s) to be obtained is believed to be from a deceased individual. If the likely DNA profile(s) to be obtained is unknown, an artifact should only be tested if it is likely that the owner of the associated DNA profile(s) is deceased. If it is determined that DNA obtained from an artifact is from a living person, that DNA shall be deleted immediately. A DNA profile obtained from an artifact shall only be uploaded to a database only if that database explicitly so permits (ex. GEDmatch “DNA obtained from an artifact”), or if that database does not so prevent. Artifact testing shall not be performed by/for someone in a jurisdiction where it would violate a legal restriction. The post elicited a spirited conversation, much of it revolving around whether the person sending in the artifact must ethically be a descendant or relative of the person for whom the potential DNA profile will be obtained from the artifact. I firmly believe that restricting artifact testing to descendants or relatives lacks a logical reason for the limitation. In the U.S. at least, the deceased don’t have rights (other than some celebrity rights in some limited jurisdictions that survive the death of the celebrity), so this won’t be about the deceased. Rather, this might be about the deceased’s family, such as children or grandchildren. This appears concerning at first, as a random person could sequence your parent’s DNA, for example. However, no testing company, for example, requires that you ask your family before submitting a sample. Accordingly, I can send in my children’s DNA without obtaining permission from their maternal grandparents, even though the test will sequence 50% of their DNA. These and other questions will continue to be discussed in the coming months. However, it is important that we consider these issues early, rather than too late. What artifacts do you have that might be suitable for testing? Next Article What? Can mtDNA Really Come From Dad? Can you find out if any company is considering extracting DNA from biopsy material embedded in paraffin? I have these samples for each of my deceased parents from the pathology lab where they were hospitalized. A friend, on an experimental basis, extracted enough DNA for a 67 marker test but there was not enough in the sample to do an autosomal test on my father. I would like to have this procedure done for my mother. The person who extracted DNA from a paraffin sample for my father no longer works in the DNA field, but surely some company may want to continue this process. I’m not aware of a company that is doing this for genealogical purposes, but it’s only a matter of time. Once things like envelopes & stamps are perfected, I predict they will branch out into other areas including paraffin-embedded samples. Hi, Blaine. To your question about Illumina’s GSA chip, the default Array-24 v2.0 chip looks at 1,180 mitochondrial markers (directly referencing GRCh37 for these loci), 4,964 Y-chromosome markers, and 1,229 in the PARs. That’s the standard setup per Illumina’s specifications, but of course that doesn’t mean ToTheLetter or anyone else would necessarily report on those data. But at least the micro-array is pre-programmed for them. Like you, I’m excited about the prospect of artifact testing opening up whole new avenues with DNA for genealogy. Exciting times! Perfect, thank you Edison! Do you happen to have a source handy online where I can refer people? Thanks! Oops. Sorry for the OLO (Omitted Link Oversight). :-/ I have all the Illumina specs stored locally, but didn’t intend to make you go look it up. No problem Edison, thank you so much for the information! I have my mother’s hairbrush, but so far no company is doing this kind of testing. Is there any hint that someone might start? There are no clear indications that it is currently being done or is being considered soon, but there’s little doubt that such services will exist within the next few years. Keep it cool and dry and uncontaminated. It is almost certain that the preservative fluid is harmful to the DNA. However, there may be untouched DNA inside the gallstones. I recommend keeping them as they are, and waiting for a service to offer this. You are not the only one, it turns out that many people have these gallstones and are asking this question! Bit dissapointing that they use the modern chip that only allows upload to gedmatch genesis, since numerous people will be on normal gedmatch, and not all matches will be on genesis. 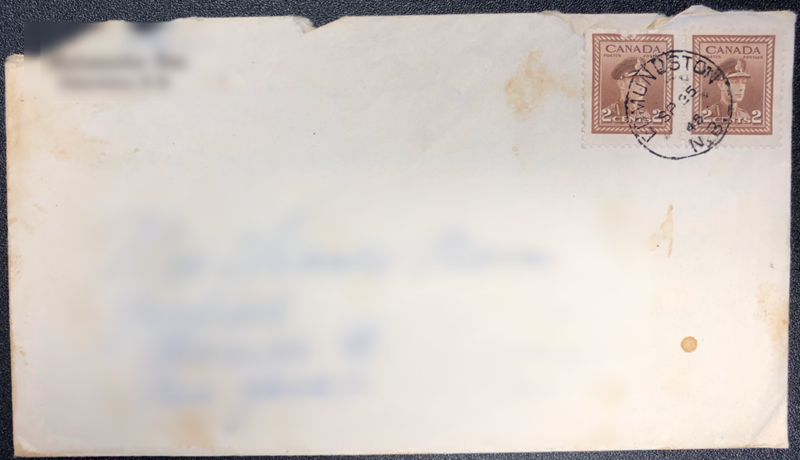 Hypothetical legal scenarios may occur – what about if grandmother sent the stamp / envelope to her daughter [ or son ] and then they passed it on to their children [ aka grandchildren ], with explicit ownership of the artifacts given from parent to ” grandchild ” written in the parents will – with no possible knowledge or correspondence from the deceased ancestor ??? Divergent comment – A similar legal issue relating to sperm donors was discussed recently [ 2018 ] on the Law Report on ABC-AU radio, with the spouse or partner having legal ownership of the frozen contents, although the laws differed in different states. Maybe a hybrid chip should be used – what if numerous different stamps are tested over a range of years – telomere length analysis may be of interest to forensic science chronologists. Surely there must be a maths geek out there that can convert the GSA [ global screening array ] data to the old gedmatch format. Leah ??? Pingback: What Can We Learn From Our Ethnicity Estimates? - Who are You Made Of? The two people I would love to find an artifact for and test are my father’s stepfather and his first wife. They are my (Kessler) know-almost-nothing-about line. My DNA doesn’t help because they’re not genetically related. I still have to thoroughly go through my father’s papers, and I’ll be thrilled if I could find a useable artifact. Good luck, I hope you find something you might be able to use! I know that cost is steep in terms of what it’s like for us as consumers out of pocket, but that’s surprisingly reasonable considering what they’re doing. I’m sure this is a long shot, but…would it be possible to simply “soak” an envelope flap or stamp in artificial saliva (99% water, 1% saline roughly), and submit it using one of the $49 kits sold by Ancestry or other testing service? I have many envelopes to choose from, so don’t mind sacrificing one or two in the name of frugality. Or would the glue or other contaminants present make the sample unusable, or the fact the DNA is “dead”? Hi Gary – other than contamination dangers, the biggest hurdle will be the tiny amount of DNA such an extraction would produce (if any). The companies perform Q&A along the way and will likely not process a kit with so little DNA. Yeah, that is sort of what I figured. Thanx for quick reply.